I had a Ladies' Night Out with Raw and the girls on Saturday night. When we returned home, Sophia did all she could to put off bedtime. Raw heard her on the stairs. "Sophia! Go to bed!" "I have to go poopy!" 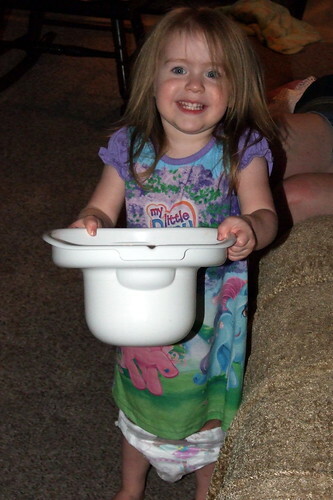 Sophia is still doing the potty-training thing, and you never want to discourage her from using the toilet. A few minutes later, I hear her approaching the living room. "I poopy in the potty!" She walks in, carrying her pot! I'm laughing as I'm telling her good job, while Raw and Mary check the goods. "That doesn't count as a poop! It's too little" Raw declared.